Watson-North Funeral Home is honored to be of service and ministry to the family of Mary Steele McBee Harris, age 79 of Estill Springs. Mrs. Harris passed away Wednesday June 27, 2018 at Unity Medical Center in Manchester. A native of Franklin County, she was a 1956 graduate of Franklin County High School. She worked for Lakeway Publishing for many years and retired from Sain Construction in Manchester in 2007 following 30 years of service. She was a charter member of Faith Baptist Church in Estill Springs which had its beginning in the living room of her home in 1975. She remained a member until the time of her passing. She will be remembered by her daughters and others who knew her as a talented musician and a “whiz” with numbers and anything related to business. Her love for traveling helped to satisfy her adventurous nature and following retirement she made a hobby of working puzzles and listening to music of many genres. Mrs. Harris is preceded in death by her mother, Lena Nell Johnson Steele and her father, William Oscar Steele; her first husband, Wayne Hardy McBee who passed away in April of 1966; her second husband, William Venoy Harris, Jr. who passed away in December 2006; son-in-law, Teddy S. McCallie, Sr. She leaves to mourn her passing and cherish her memory, her daughters, Sandra McBee (Victor) Warren of Shelbyville; Pamela McBee (Danny) Jernigan of Manchester; Linda McBee McCallie of Winchester and Pamela Harris Martin of Decherd; grandchildren, Tammy (Wayne) Hodges, Benjamin (Missy) Smith, Jennifer Jernigan, Jonathan Smith, Teddy S. McCallie, Jr., Sarah Warren and Mark Warren; 10 great-grandchildren and 3 great-great grandchildren. The family will receive friends at Watson-North Funeral Home on Friday June 29, 2018 from 5-8 p.m. 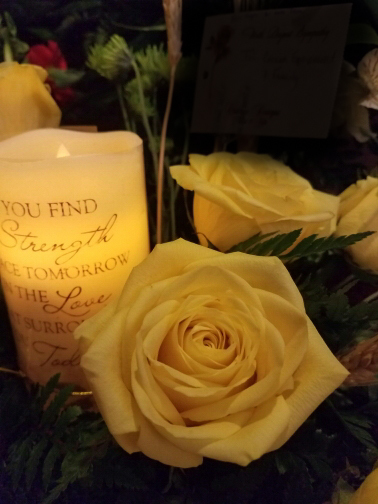 The funeral ceremony will be Saturday June 30 at 11 a.m. in the Roy B. Watson Chapel of Watson-North Funeral Home with Pastor Randy Jackson of Faith Baptist Church and Rev. Richard Reed officiating. Interment will follow at Franklin Memorial Gardens with friends and family members serving as pallbearers. For those who so desire, the family requests memorial contributions to the Alzheimer’s Association at act.alz.org/donate. Online condolences may be sent to www.watsonnorth.com.